Products | Toyoda Gosei Co., Ltd.
We use advanced technical skills to develop and produce rubber and plastic products in four areas. In a system that covers all steps in manufacturing, from materials development to production and processing, we continue to introduce high value-added products that raise the performance of automobiles. 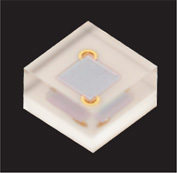 LEDs with new added value are being developed. Red, green, blue phosphor is irradiated with violet light to achieve a color tone close to sunlight. 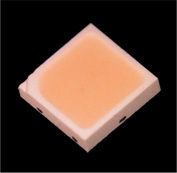 LED that emits deep ultraviolet (UV-C) with a bactericidal effect is used in sterilizing water (ensuring drinking water, water purification). Using the technologies we have cultivated for automobile parts, we develop products in various other fields. Our business is growing in areas ranging from air purifiers, for which we are involved in all steps from design to production, to construction and industrial machines, home construction components and personal electronics. 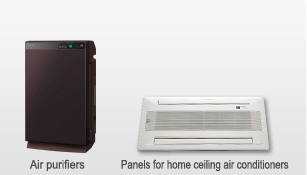 We are a top OEM manufacturer of air conditioners, providing a wide range of variations in performance, design, color, and more. 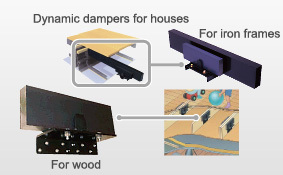 These products use vibration suppression rubber technology to suppress footstep sounds on upper and lower floors in houses and create a quiet, comfortable environment. 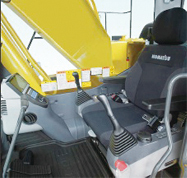 Steering wheels, shift levers, and instrument panel components for construction and industrial machines including forklifts and power shovels. These LED light products can be charged by simply pulling a wire. 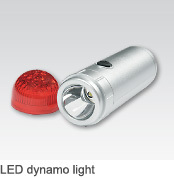 They can be used in vehicle emergencies, disasters, and for early morning and evening walks.